BikeBrain is a new class of bicycle computer that brings route directions to life by prompting you at every turn and point of interest on your rides. You download route directions to BikeBrain® and it displays exact route directions as you ride. BikeBrain also provides complete cyclometer functionality, a real-time speed graph, an altitude profile of the route, and speed logging for post-ride upload and analysis on a desktop computer. We've designed Bike Brain for use with 3Com's Palm® series of personal organizers. Palm organizers are ideally suited for Bike Brain because of their small size and large screen display. Bike Brain software runs on Palm organizers and includes a skin-tight case, an adaptable and shock-absorbing mount, a wheel sensor, and desktop software for route publishing, downloading and ride analysis. 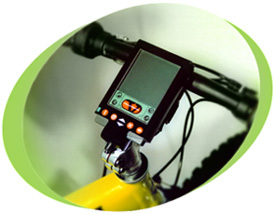 Unique, patented feature to display and record bicycle route sheets. Prompts that tell you when and where to turn - no need for paper route sheets. Altitude profile of routes so you know how far the summit is. Real-time graph of speed vs. time and speed vs. distance. This screen is displayed when you're riding and recording a route. Every time you press the X button this screen prompts you for the route direction. You annotate these directions on the BikeBrain Desktop. Graph scrolls so the right hand edge is the current time.